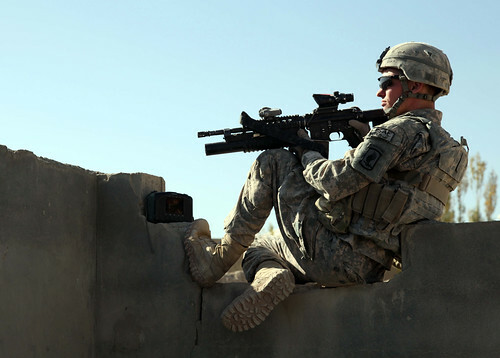 US Soldier provides security during a patrol in Logar Province, Afghanistan. DoD photo by Sgt. Sean P. Casey, U.S. Army. It’s important to remember what’s at stake here- if we win in Afghanistan at best we’ll get another Central Asian state with an unstable, undemocratic and authoritarian government that enjoys only nominal control over most of its territory and without any real prospect for economic growth or national unity. Of course, that’s much better than what Afghanistan once was. But this report underlines an unhappy fact- even if we do defy the odds and historical precedent and succeed in Afghanistan we’ll probably never know for sure how much we’ve spent on Afghan reconstruction, or how effective it’s been. Now, just before the mid-term elections, the political advertisements are blaming the new health care plan for the economic situation of the United States. The truth is that very little of the new health care plan has gone into effect yet, and it is not the reason for the multi-trillion dollar debt of the U.S. economy. The gigantic amounts of money that have been poured into Afghanistan and Iraq over the last 8 or 9 years is the cause. I am tired of the U.S. being responsible for policing the entire world, and spending our money to do so. There are people in the U.S. that are losing their jobs, their homes are being foreclosed on, and so on. It is now time to bring the focus back home. Eventually, the U.S. will leave Afghanistan and it will probably be no different than before we arrived. Bribing politicians in Afghanistan has done very little to guarantee the safety of the American people, or the Afghani people, for that matter. I wish our government would wisen up and stop these handouts.